*New Rental & Renovated* Gated Resort w/ Mini Golf, Pools - Game Loft & View! Cougar Ridge is located in the prestigious gated Bear Creek Crossing Resort with an indoor pool that is open year-round, mini-golf course, and outdoor pool with waterfall backdrop! Only 3 miles to the Pigeon Forge Parkway! *Perfect for Honeymooners, Anniversaries, a couple’s getaway, or small families with kids! *End of the cul-de-sac privacy! * ALL NEW Furniture, Pool Table, and Arcade Game. * Keyless entry system for guest convenience and safety (go directly to cabin). *No treacherous, scary winding roads! Plenty of level parking - hard to find in a mountain resort! * Looking for a 2 bedroom cabin? We've got one: VRBO#777183 just 3 miles away! •	Large Master Bedroom suite with King bed, private bath with tub and shower, electric fireplace, 40" TV with Blu-ray player and free Netflix located on the main level. •	Washer/dryer combo in closet on main level. •	Indoor heated pool: open year-round! *NO SMOKING, NO PETS, NO PARTIES, NO YOUTH GROUPS, NO MORE THAN (4) FOUR PEOPLE. *Must be 26 to rent. Enjoy the tranquility of the mountains or head out to explore all the fun and excitement of Pigeon Forge and Gatlinburg. A variety of restaurants are only 3 miles away along with Kroger, Publix and Walmart for grocery shopping. Dollywood, go-karts, mini-golf, WonderWorks, live shows, and the Tanger Outlet Mall are only minutes away. Don’t miss the Great Smoky Mountains National Park, Ober Gatlinburg with skiing, ice skating, tubing, aerial tramway, shopping and more. There is so much to do, or do nothing at all! Cougar Ridge is very close to all the local attractions yet remote enough for you to experience the serenity of the mountains. It is located just 3 miles from Pigeon Forge, 7 miles from Dollywood & Splash Country, and 13 miles from downtown Gatlinburg. The cabin is in a resort community so there are other cabins nearby. Cougar Ridge is located at the end of a small cul-de-sac (neighbor on only one side) off the main road and has plenty of level parking. Great location - traveling to the attractions in Pigeon Forge and Gatlinburg is easy by taking the back roads to avoid tourist traffic on the Parkway. *Cougar Ridge’s rental agreement and a copy of guest photo ID must be completed and returned to owner within 2 days of booking. Payment: 50% of the total rent is due at the time of booking. The remaining 50% and the refundable $150 damage deposit is due thirty (30) days before arrival. Reservations made less than thirty (30) days prior to arrival require 100% of the total rent and the refundable $150 damage deposit at the time of booking. Cancellation Policy: 100% refund if you cancel at least 60 days prior to arrival and a 50% refund if you cancel at least 30 days prior to arrival. No discounts or refunds will be given for no-shows, late arrival, early departure, or if you are unable to arrive at the cabin due to bad weather, snow, or road conditions. Chains and/or 4-wheel drive are recommended for snow and ice. We suggest cancellation/travel insurance. Cougar Ridge is a beautiful cabin for honeymooners, anniversaries, a quiet romantic getaway, or a family vacation. We love the fact that it is in a gated community with indoor and outdoor pools and a mini-golf course! Enjoy the beautiful view of Bluff Mountain during the day and spectacular sunsets each evening from the deck! The large master bedroom with fireplace is on the main level. The game loft has a new pool table, a pub-table, an arcade game- all brand new! Every detail has been carefully attended to for the enjoyment of our guests. We recently purchased Cougar Ridge and are excited to share it with you! 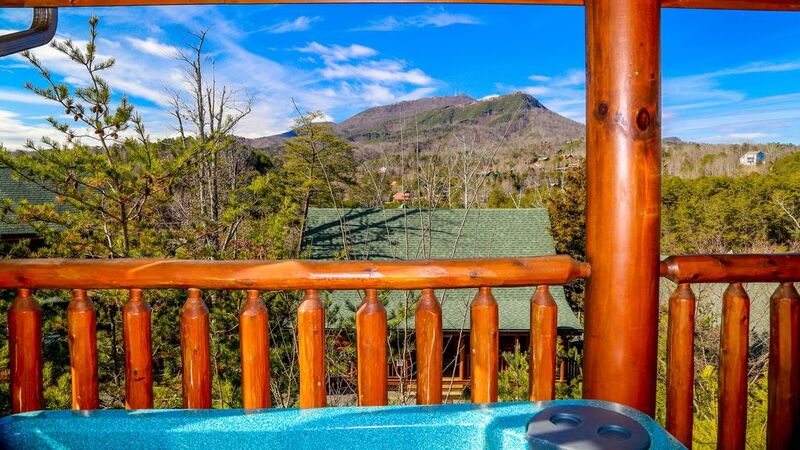 Cougar Ridge is just 3 miles from the Parkway and a great location for your vacation home base - close to shopping, dining, and all the fun and excitement of Pigeon Forge. Bear Creek Crossing Resort has it all! It is gated for your security and has a seasonal outdoor pool with waterfall backdrop, year-round indoor heated pool, and a mini-golf course! Cougar Ridge has a beautiful view of Bluff Mountain with spectacular sunsets! Keurig and drip coffee makers. Filters, creamer and sugar provided. A large variety of dishes and cooking utensils are provided for guest use. Amish made log table with seating for four. Bedroom: 40" Loft: 32" Living Room: 50"
Blu-ray players in the bedroom, loft, and living room. New pool table, pub table and 2 stools, arcade game and comfy queen futon. Basket with games for all ages. Resort Mini-Golf. We provide the putters and balls! Resort indoor pool open year-round! Resort outdoor pool open May-Sept. The cabin was amazing! Amazing views from the back porch, very clean and well kept. We felt at home the moment we walked through the door. Property owners were very helpful and quick to respond to questions or concerns. My wife and 3 children will most definitely be back in the near future. Great Cabin ! They have everything you will need for a great getaway. Plan to stay again. Linda is very nice to work with. We loved this cabin - very modern, nicely decorated, and most importantly very clean. It has all the appliances/amenities you would need to spend a nice family vacation in the Smokeys. It has a pool table and arcade game in the loft. My kids loved that. The hot tub was a hit with my family and it was clean. It is also very close to all the local attractions. Linda was great to interact with. We'd highly recommend this cabin. We loved this cabin. It was absolutely immaculate. All the amenities, everything we needed was there. Great view, flat level parking at the end of the cul-de-sac. We'll be back! We enjoyed our stay. The cabin was everything we hoped for. This cabin was completely stocked with everything you could possibly need. The decor was perfect for the environment. Bed was super comfy, the views were so gorgeous! Mrs Linda (the owner) is very helpful & lets you know she’s available for you should you have any questions. Will definitely book here again! Highly recommend! Cougar Ridge is located right next door to it's twin cabin, Sunset Ridge (VRBO#1331812) and just 3 miles from Pigeon Forge where you can find Dollywood, Splash Mountain, shopping, dinner shows, a multitude of restaurants, The Island, mini-golf, go-karts, mountain coasters, Cal Ripken Experience, Tanger Outlet Mall and more! Gatlinburg is only a short drive down the Parkway and boasts the Great Smoky Mountain National Park with hiking, scenic drives, rafting etc. The streets of Gatlinburg are full of shops and restaurants. Don't miss the Aquarium and Ober Gatlinburg ski resort.